"I have lost confidence in my own ability"
"I've taken a long career break, and now I'm not sure whether my skills and experience are relevant in today's job market"
"I want a family-friendly job, but don't know what to do or how to find it"
Inspired Mums was founded to help women like you live a fulfilled and balanced life. Coaching is a very individual experience - you will decide your personal goals and - with the support and commitment from your coach - create a compelling plan to realise your aspirations. 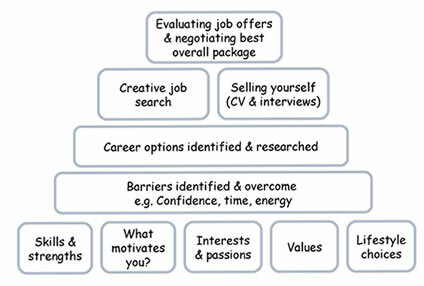 "To enjoy your work, you must play to your strengths"
"To feel fulfilled, your work must motivate you"
"To feel balanced, you must take the rest of your life into consideration"
Our career coaching will help you gain the confidence and clarity to make the right decisions going forward, allowing you a greater sense of fulfilment and job satisfaction. We have lots of tools and techniques to help you identify who you are, what you want and how to get – as quickly and easily as possible. This summarises all the typical areas we work on with clients. Our coaching programmes are entirely tailored to your needs and budget. Some people ask for our help throughout the career change process – whilst others need our help with more specific areas such as boosting their confidence or selling themselves on paper or at interview.